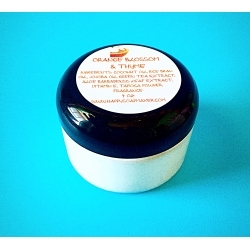 Natural homemade whipped body moisturizer with Apricot Kernel Oil, Green tea and Aloe extracts. This handmade Body Butter is a rich moisturizer for your skin, beautifully scented with classic mixture of almond and warm honey notes. This body lotion will nourish and condition your skin leaving it silky-smooth. Almond & Honey handmade natural body lotion melts into your skin on contact, softening, deeply hydrating and protecting even the most sensitive skin types. Apricot Kernel Oil has a lot of great properties for skin: brilliant emollient ( moisturizer ), provides nutrition and support to the skin so that aging is reduced, prevents the skin from damage by free radicals and others. This whipped natural homemade body butter contains Green Tea extract which is naturally rich in antioxidants, which has a cell-protecting function as well. It’s a strong antioxidant effect that protects the skin from the damaging effect of free radicals. Green tea extract also contains the Methylxanthines that stimulates skin microcirculation and therefore positively influence the tone and health of the skin. Also it contains Aloe Vera extract which moisturizes the skin. It enhances the appearance of dry or damaged skin by reducing flaking and restoring suppleness. This extract removes wrinkles and gives skin a healthier and younger look. It is an ample source of Vitamin E which is a nutrient to assist in providing healthy skin. It reduces the skin damage which is caused by continuous scratching. Sun burns can also be treated by using skin care product made of pure Aloe Vera extract. It can also be used for treating acne problems, dryness of the skin and many other types of skin problems. If you are a Chanel lover - this whipped homemade body butter is a woman's dream!!!!! Very sophisticated and enchanting fragrant (blend of hyacinth, jasmine and iris with a hint of sparkling citrus). 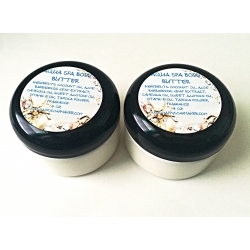 This body butter is full of great benefits for the skin. It leaves your skin feeling soft and silky all day, helps to nourish your dry and sun damaged skin with great moisturizing and healing properties. It is enriched with Calendula extract and Aloe Vera extract. Calendula has anti-inflammatory properties. It is also suggested to combat rough, scaly and dry skin. Perfect for sun care. Aloe Vera extract moisturizes the skin. It enhances the appearance of dry or damaged skin by reducing flaking and restoring suppleness. Absolutely NO HARSH CHEMICALS - No petroleum - No Parabens - No preservatives. Coconut oil which is rich with many proteins. These proteins keep skin healthy and rejuvenated, both internally and externally. Proteins also contribute to cellular health and tissue repair, along with a wide range of other essential activities within the body. Avocado Oil can also help soothe sunburned skin. Avocado oil contains sterolins, which are natural steroids. They may be effective in boosting collagen production and in treating age spots. With its high level of vitamin E, avocado oil may reduce itching and inflammation of the skin and is also beneficial in softening rough and cracked skin. 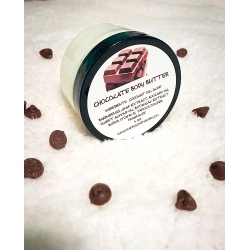 Nourish your body with this Chocolate Whipped Handmade Body Butter Moisturizer. This yummy body cream smells and feels amazing! It is enriched with Botanical extract blend including Aloe Vera extract. Absolutely NO HARSH CHEMICALS - No petroleum - No Parabens - No preservatives. Coconut oil which is rich with many proteins. These proteins keep skin healthy and rejuvenated, both internally and externally. Proteins also contribute to cellular health and tissue repair, along with a wide range of other essential activities within the body. Coconut oil is a great skin softener and helps you do away with dry and hard skin conditions. 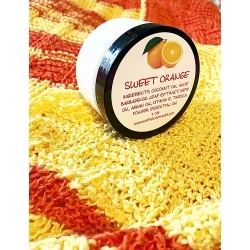 Has a high moisture retaining capacity so it acts as an excellent moisturizer for your skin. Contains mostly fats, so it acts as an emollient providing a softening and soothing effect. It contains medium chain fatty acids which are absorbed into the skin, where they can be directly utilized for nutrition and energy. This provides all the energy your skin needs to heal and maintain itself Sweet Almond oil is rich in vitamin A, B and E, which are great for skin health. The oil helps maintaining moisture levels of the skin and gets absorbed in a jiffy without blocking the pores. 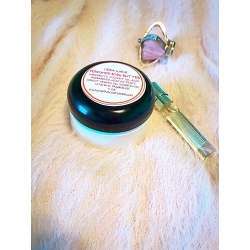 Overall, Sweet Almond oil for skin care helps: Improve the complexion and retaining glow; Moisturize better and deeper; Soothe skin irritation and skin inflammation; Relieve dry and irritated skin; Nourish skin, making it softer and smoother Avocado Oil can also help soothe sunburned skin. Avocado oil contains sterolins, which are natural steroids. They may be effective in boosting collagen production and in treating age spots. With its high level of vitamin E, avocado oil may reduce itching and inflammation of the skin and is also beneficial in softening rough and cracked skin. Now here’s the trick about body butter. It’s best to rub in a light layer of the body butter just after a hot shower while the pores of your skin are still open. It may feel a little greasy just after application, but within minutes it will soak into your skin. The result is soft and glowing skin (not greasy!). Remember that body butter is thick and luscious. A little bit goes a long way! 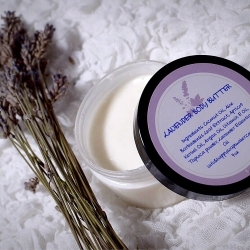 This listing is for one 4 oz all natural Whipped Body Butter. Natural homemade whipped body butter with Jojoba Oil, Green tea and Aloe extracts. 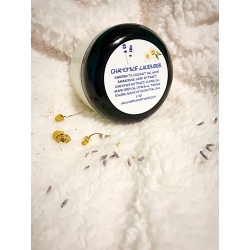 Wonderful moisturizer for your skin, beautifully scented with Orange Blossom & Thyme aroma (bright citrus, honeysuckle and orange blossom are enhanced with hints of fresh herbs). This Moisturizer will nourish and condition your skin leaving it silky-smooth. This handmade natural body lotion melts into your skin on contact, softening, deeply hydrating and protecting even the most sensitive skin types. This natural homemade body cream contains Green Tea extract which is naturally rich in antioxidants, which has a cell-protecting function as well. It’s a strong antioxidant effect that protects the skin from the damaging effect of free radicals. Green tea extract also contains the Methylxanthines that stimulates skin microcirculation and therefore positively influence the tone and health of the skin. This nourishing facial mask will leave your face feeling incredibly soft, smooth and looking absolutely radiant. It soothes inflammation as it moisturizes, heals skin disturbances, evens skin tone and gives a dose of anti-oxidants. When applied to the skin, this facial treatment acts as a powerful detoxifier that draws out toxins and impurities while adding beneficial nutrients. It is said to have antioxidant properties that help to reduce the appearance of wrinkles. Benefits of this mask are great: repair damage skin cells protect the skin from free radical damage, fight skin inflammation and irritation, slow down the aging process of the skin, protect the skin from harsh everyday elements, release toxins from the skin, rejuvenate, prevent wrinkles, hydrate and brighten your skin. - Kelp Powder which is a large brown seaweed belonging to the Laminaria species. Kelp grows in “underwater forest” and their height can reach up to 60-80 meters. Seaweed contains fatty acids to combat skin irritation and inflammation and may assist with skin ailments such as acne, psoriasis and eczema. Kelp is a rich source of proteins, minerals and vitamins including vitamins B12, vitamin E and other nutrients. - Rose Hip Rowder cleans the face skin leaving it better oxygenated and purified. Rosehip seeds perform a mildly peeling of the epidermis, removing dead cells accumulations and smoothing the face skin. Rosehip powder smoothes the skin, removes dead cells and regulates the skin relief. - Oatmeal Colloidal naturally moisturizes and creates a protective barrier on the skin. It also acts as a natural pore cleanser, and is soothing to sensitive skin. Direction: Mix a teaspoon of the powder with a small amount of liquid (coconut water, aloe vera juice, tea, water, etc.) to form a paste, and then smooth over your skin carefully avoiding the eyes, mouth and mostrils. Leave on for 10-15 min and rinse thoroughly with warm water and apply your cream. To enjoy glowing, healthy looking skin, use this mask twice a week. I promise you will enjoy this mask and make it a regular part of your beauty programme. This is listing is for 2 oz jar. It is full of great benefits for the skin. It leaves your skin feeling soft and silky all day, helps to nourish your dry skin with great moisturizing and healing properties. In this recipe I whipped Almond Butter with Argan Oil, Avocado Oil and Vitamin E.
Almond Butter is wonderful butter which is hydrating, moisturising, has natural emollient properties and is rich in minerals, anti-oxidants and vitamins. Avocado Oil can also help soothe skin. Avocado oil contains sterolins, which are natural steroids. They may be effective in boosting collagen production and in treating age spots. With its high level of vitamin E, avocado oil may reduce itching and inflammation of the skin and is also beneficial in softening rough and cracked skin. My homemade Raspberry whipped body butter is full of great benefits for the skin. It leaves your skin feeling soft and silky all day, helps to nourish your dry and sun damaged skin with great moisturizing and healing properties. 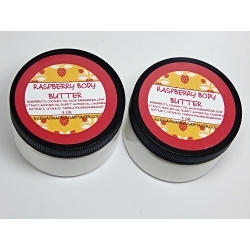 Raspberry Body Butter is enriched with Calendula extract and Aloe Vera extract. Calendula has anti-inflammatory properties. It is also suggested to combat rough, scaly and dry skin. Perfect for sun care. Aloe Vera extract moisturizes the skin. It enhances the appearance of dry or damaged skin by reducing flaking and restoring suppleness.